OK, so we’ll have one more day of the new Earth Warriors deck, and tomorrow we’ll return to randomness. 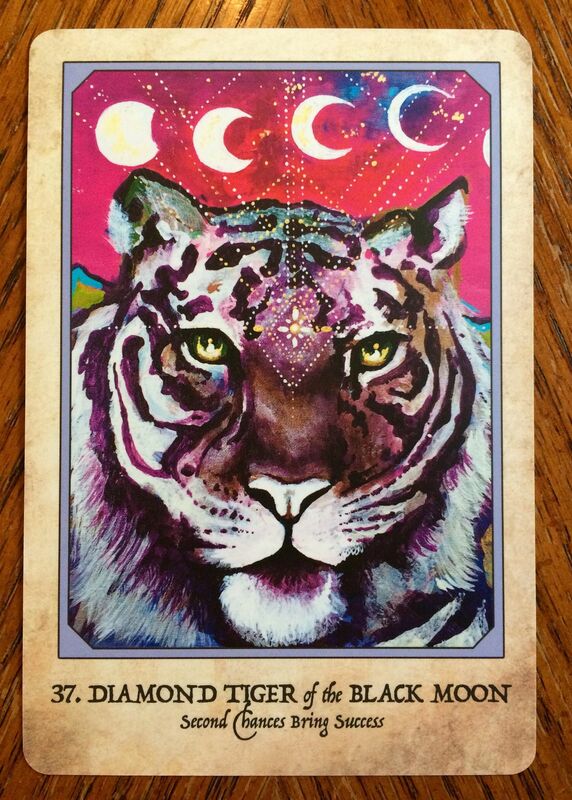 The other two cards I drew were also strong, so I thought I’d mention them: White Buffalo Woman (Hopeful Heart, See Her Sign) and Panthera (The Precious and Rare). Hope everyone has an blessed and beautiful Friday! Your soul is on the diamond path of spiritual growth. You may feel pressured by life at times, but at a higher level, those challenges are helping you realize your true strength of character. You have the personal will, strength, and physical power that you need for success, no matter what has happened in the past. You are developing the spirit, passion, and vitality to fight like a tigress defending her cubs. Believe in yourself. There is great dignity in your heart. Meaning: Do not judge anything or anyone, including yourself and what you believe is possible, based on the past. Reclaim and redirect your energy according to what matters most to you. You are stronger than you may realize. The return of strength after a challenge, second chances for success, and a brilliant intuition or insight that ends a long-lasting cycle of repeated struggle are indicated. A prophecy is given for empowered leadership, spiritual attainment and success after previous failure, which leads to an irreversible and positive outcome. Guidance (shortened from the book): The struggles of your past were needed in order to grow. Yet now, having fulfilled their spiritual usefulness, they are no longer required. If you continues to interpret your life experiences through the filter of old beliefs and past happenings, you will lose the truth of what is taking place at a deeper level. You are being reformed, renewed, reborn, into a stronger, clearer, Truer version of yourself. The past was needed to get you here, but it is no longer to be seen as something that defines you.